Our third Foreign Correspondent has returned from her travels! Mary, her husband, and her two children traveled to Mexico this winter. We outfitted them with a suitcase full of Tea before they left, asking them to share their adventures with us upon their return. Below is part four of their adventure. To learn more about her family’s adventures, check out her The World is a Book blog. While souvenirs are mostly associated with trinkets, I’d rather like to think of its other Spanish meaning of “recuerdo” – a memory. This is how we want to look at souvenirs – tangible memories of a wonderful family vacation. It was quite appropriate since our family visited predominantly Spanish speaking countries of Mexico, Belize and Honduras. My 9-year old daughter says a souvenir is special because “it helps me remember where I’ve been”. Mexico was a treasure trove of souvenirs for all of us. We were a little bit more restrained in Belize and Honduras as our time was limited and shopping wasn’t as abundant compared to Mexico. Imagine the excitement with the variety of maracas they could play with and the number of sombreros they could try on. 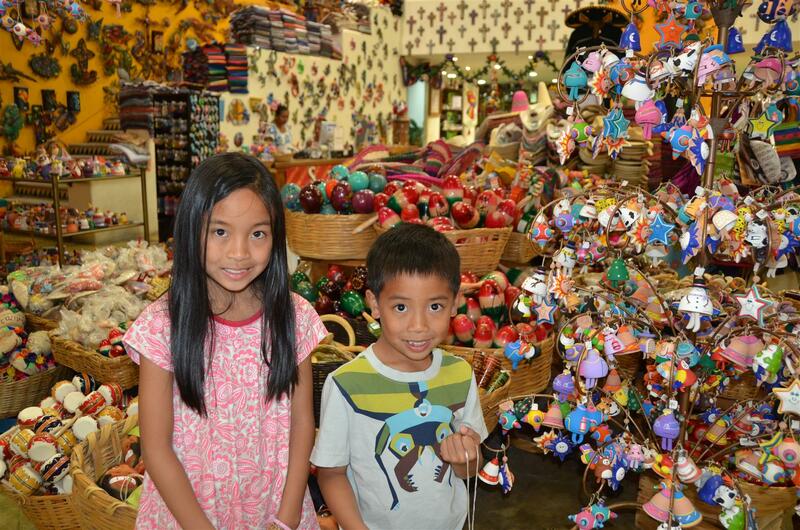 So, what were the most popular souvenirs for kids when we visited Mexico? The typical maracas, small guitars, marionettes and sombreros were everywhere. But, the one with the most appeal to children, especially boys, were the Lucha Libre masks. These were the colorful masks of animals, heroes or pop culture items that Mexican wrestlers wore. Souvenirs are not only about the shopping experience but also the cultural association with a place. Over the years, we’ve bought dolls and beanie babies representing each country or city visited. We’ve probably collected enough to assemble our own United Nations parade. My daughter found more dolls from three new countries during this trip, each wearing their traditional native costumes to add to her collection. I’m glad she’s still young enough to enjoy them. It’s a simple connection she has to a country and a culture. Interacting with the vendors and practicing friendly phrases in the local language is among the joys of shopping in a foreign country for us. Our kids loved saying ‘Hola’, ‘Gracias’ and ‘Adios’. They enjoyed saying the minimal Spanish they knew and the vendors were more than happy responding with big smiles on their faces for attempting to talk in the native tongue. We’ve found through the years that a simple hello and thank you to vendors in their local language goes a long way while traveling. When the vacation is over and as they go on their daily lives, souvenirs can transport the kids back to that special time and place. Souvenirs can represent the local people they met, the areas they explored and their experiences during the visit.